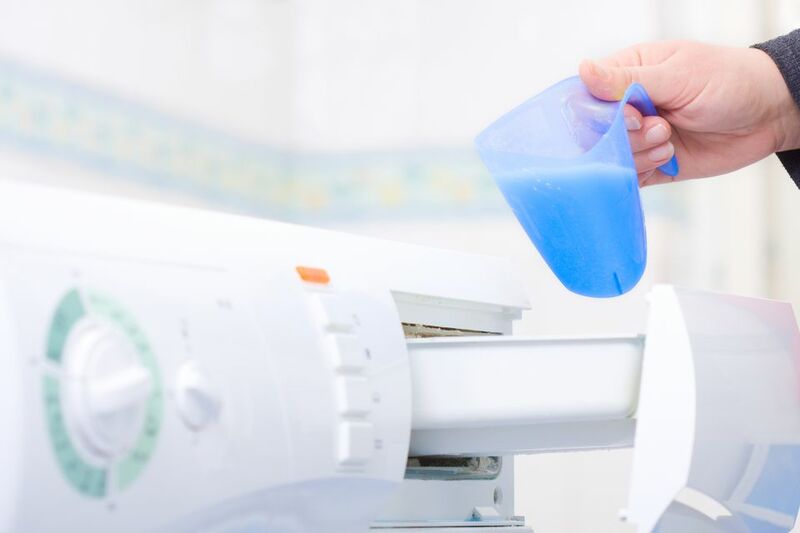 Optical brighteners are synthetic chemicals added to liquid and powder laundry detergents to make clothing appear whiter and brighter, and thus cleaner. They are the modern day replacement for the decades-old practice of bluing—adding small amounts of blue dye to fabric to make it appear whiter. Trade Names: Blankophor, Dikaphor, DMS, Intrawite (textile use), Kolocron, Optiblanc, Tinopal, Tuboblanc (textile use mostly), Uvitex. Optical brighteners transform UV (ultraviolet) light waves to enhance blue light and minimize the amount of yellow light to make things appear whiter. So, they don't get your clothes any cleaner, but make them appear whiter and brighter. What they do, though, is stay on your clothes as they can resist heat and even chemicals like bleach. You can detect optical brighteners using a special UV or black light and will notice that your clothes glow! Optical brighteners are also used in the manufacture of paper, textiles, plastics, paint, printing inks, and cosmetics. They have also been used to detect waste water leakage, help with medical diagnostic procedures, and kill agricultural pests. Per Title 21, optical brighteners are regulated by the Food and Drug Administration (FDA) when they are used in materials that come into contact with food, such as plastic and paper packaging. When they are used for other things, such as in the cleaning industry, they are monitored by the Environmental Protection Agency (EPA). According to the article "Key Characteristics of Laundry Detergents" by Design for the Environment (DFE), an EPA partnership program, optical brighteners may be potentially toxic to humans and "Aminotriazine- or stilbene-based whiteners may cause developmental and reproductive effects." However, the article also notes that further testing is needed to confirm these concerns. Questions about skin reactions have also been raised, and many studies have shown no sensitization; however, one study that did patch testing noted no sensitivity occurred unless UV light or "abrasive action" was used. So it seems that there is a potential for problems if you wear clothes impregnated with optical brighteners in natural sunlight. A study done by the Environmental Protection Agency (EPA) back in 1975 questioned the environmental and health effects of optical brighteners. They noted that over 29,000,000 lbs. of U.S. produced optical brighteners went into laundry detergents in 1969, presumably much more is getting dumped into laundry detergents today and ending up in our water. Today the EPA's DFE program invites laundry formulators to partner with them to act as environmental stewards by making products that are more eco-friendly. For optical brighteners, the program encourages manufacturers to use those that pose "low toxicity to humans and the environment both as parent chemicals and degradation byproducts." Optical brighteners aren't readily biodegradable and may bioaccumulate, so they pose a potential hazard to aquatic life. Also, according to a 2011 report by the European Ecolabel Commission on criteria for laundry detergents, as optical brighteners undergo photodegradation, numerous metabolites may be produced that are not yet identified, which means we may not know the true potential impacts upon the environment. Given these questions regarding environmental effects and the huge amounts of these chemicals being used today, it seems wise to cut back on our usage of them when we can. Start by voting with your pocketbook and not buying laundry detergents with optical brighteners! Soaking clothing in lemon juice and water before laundering and then hanging them out to line dry in the sun works like a charm. Hydrogen peroxide and water solution can work too. Another eco-friendly solution is to purchase one of the many non-chlorine oxygen based bleaches on the market, such as Seventh Generation's Natural Oxy Stain Remover.